I don’t think I know of any other foods as versatile as pasta. You can cook it in 10 minutes and have dinner on the table in way less than 30. I always have some in the cupboard and the kids love it. Some pasta dishes can be eaten cold like this Poached Salmon Pasta Salad, but some need to be hot. Cold Chicken Alfredo, I just can’t, but cold penne with grilled chicken, sign me up and take my keys! 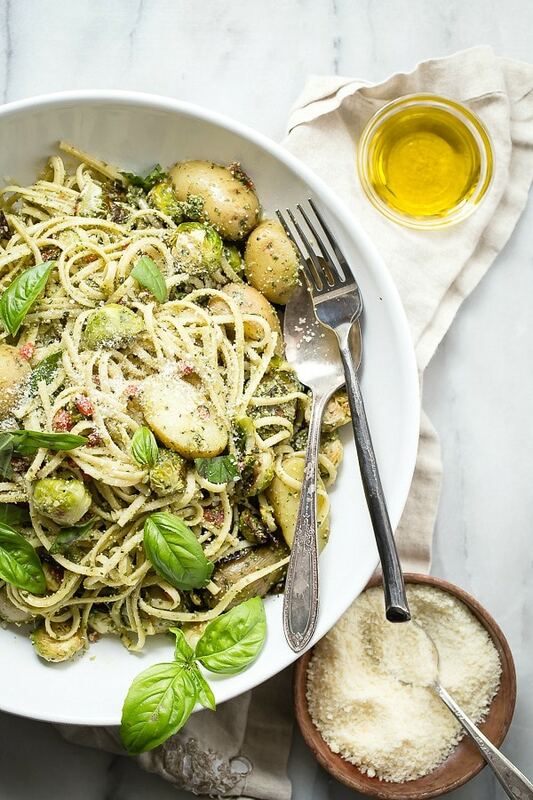 This Pesto Linguine is both hot and cold certified. It would make an awesome pasta salad for a summer picnic, but it’s almost November so I guess that’s not an option. I warmed it up for dinner and added grilled salmon to it and it was silly good! As with most pasta dishes, olive oil is usually involved in some way. I used Pompeian Smooth Extra Virgin Olive Oil in this recipe, it’s low in acidity and delicate in flavor. The oil is produced from selected olives from the first cold pressing and carries the USDA Quality Monitored seal. It’s so smooth that you can literally drink it. 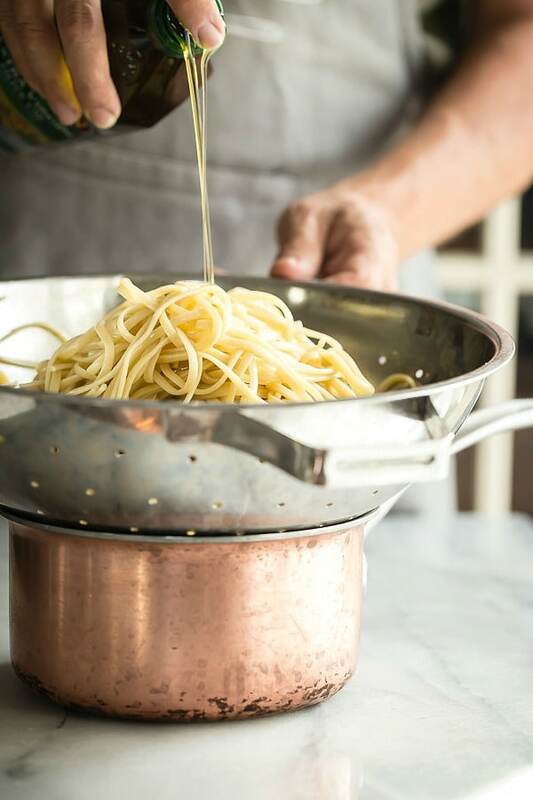 Once my pasta was cooked and drained, I rinse it to remove any starch and added a splash of oil to loosen up the strands of linguine. The ingredients are pretty simple. Boiled baby potatoes, roasted brussels sprouts, diced red peppers and pesto. The extra virgin olive oil with it’s fruity smooth taste was perfect for making the fresh pesto. Toss them all together and smother with Parmesan cheese. Fresh basil leaves, another small drizzle of olive oil and you’re ready to eat one of the simplest, tastiest pasta dishes ever! 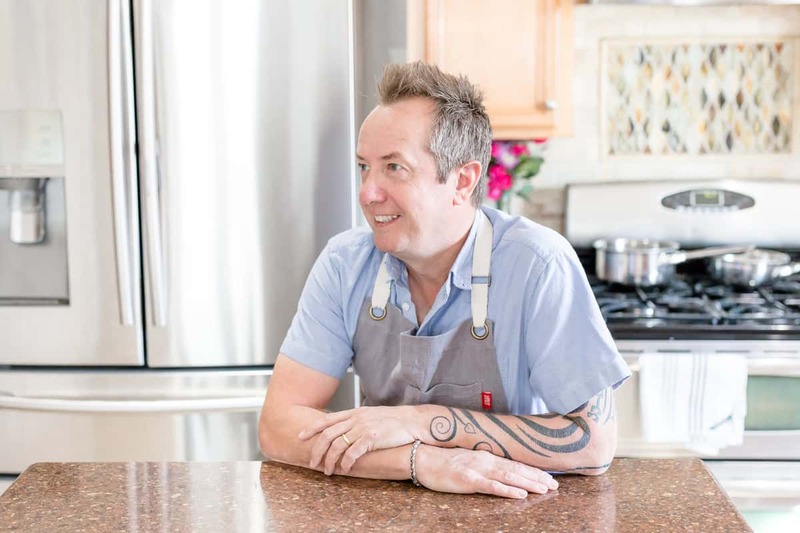 As a Pompeian Pantry Insider and ambassador, compensation was provided or this post. As always all thoughts and opinions are my own. 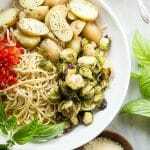 A fresh tasting easy pasta salad with potatoes and roasted Brussels sprouts. Tossed in a pesto dressing and covered in grated Parmesan cheese. Place the basil leaves, garlic, Parmesan and pine nuts in a food processor or blender. Turn on high and drizzle 1/2 cup extra virgin olive oil in slowly until it emulsifies. Bring a large pot of water to a boil and cook the potatoes for about 20 minutes or until they can be pierced easily with a knife. Drain and let cool. Place the brussels sprouts on a baking tray and drizzle with the remaining two tablespoons extra virgin olive oil. Season with salt and pepper. Roast in the oven for about 15-20 minutes. Cook the pasta as per the instructions on the package. Drain and transfer to a large bowl. 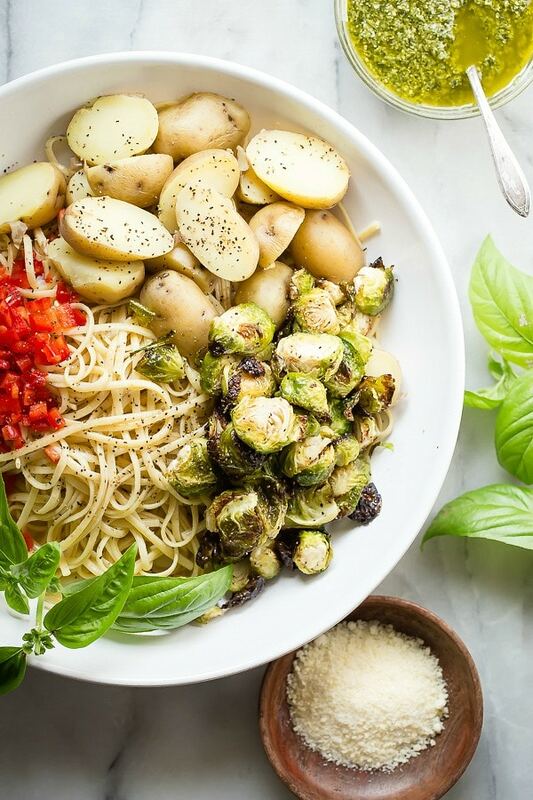 Cut the potatoes in half and add to the pasta along with the brussels sprouts and red pepper. Add some of your pesto sauce and toss well. Add more if you prefer. Garnish with grated Parmesan cheese and basil on top. If you prefer this pasta warm, add a small amount of cream and heat it gently in a pan covered with a lid for about 5 minutes. Love the potato and pasta combo. I never would have thought of it until I had it at a dinner I went to and it’s SO good. It’s the simple things Heather, right! This is such a truly gorgeous post! Wow! Beautiful! Love the combination of the linquine, potatoes and Brussels sprouts – so satisfying and delish! This is one gorgeous pasta dish! Simple and tasty are two of my favorite words! This looks fabulous Gerry! Dinner is always in a hurry and this would be a big hit at my house! Delicious!! This pasta is the perfect mix of flavors and delicious olive oil. I sorta wish I could wake up and eat this for breakfast. I’m the type of weirdo who loves pasta for breakfast…haha. I like your style Brandy! Oh this is a meal after my own heart! I could eat this nightly. I love new ways to spruce up pasta! And, adding carbs to carbs? Heaven!